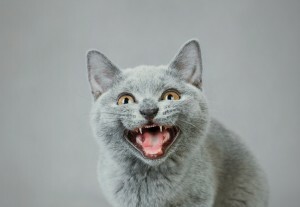 Did you know… Adult felines have 30 teeth. Kittens only have 26 temporary teeth, which they will lose when they’re about 6 months. Most kitties lose their baby teeth without humans ever noticing. The health of your feline’s teeth is very important. If your cat has stinky breathe, it could be a sign of a digestive problem or gum condition. Swelling of the gums may be an indication of internal problems, such as kidney disease. For healthier teeth, give your feline treats and toys that will help floss and clean their teeth.